Gisborne Park Senior Ladies Champion and the youngest club champion ever at 15 years old. Hawkes Bay – Poverty Bay Russell Grace Inter-provincial team. Gisborne Park Senior Ladies Champion. NZ Maori Golf Ladies Champion – Springfield. Won the Russell Grace Cup for Hawkes Bay-Poverty Bay. Set new course record at Gisborne Park. NZ Maori Golf Ladies Champion – Ngamatu. NZLGU, Junior Golf Team to play the Schweppes Junior Golf Week. Won the Poverty Bay Ladies Open Golf Championship. Captained the NZ Junior Team to Australia. Won New Zealand Under 23 Open. NZ Senior Ladies team as an 18 year old. Francis was known as “The little Miss Sphinx of the Links”. 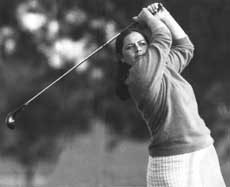 Played for NZ v’s Great Britain in Sydney won her singles 3&1 lost her foursomes 1 down. Drew with Australia 6-all. NZLGU Senior Ladies Tasman Cup in Australia and Espirito Santo World Tournament.